The last couple of years, I’ve taken VIA Rail to Jasper for Christmas. The Canadian’s only running two days a week this winter instead of the thrice a week that it’s been running for the last couple of decades, but both years it’s worked out that a westbound train leaves Edmonton early Christmas morning and gets in to Jasper station shortly after noon. If you aren’t already a VIA Rail enthusiast, the trip to Jasper is a good way to try it out. You can enjoy the comfortable seats in economy class with lots of leg room, fold-out leg rests, and electrical sockets at every pair of seats. If you’re a larger party, the train personnel will often rearrange other travellers and rotate some of the seats backward so that you can all sit together and face each other. Economy-class passengers can go to the snack bar or dining car, and you can enjoy the view from the dome car. It’s probably obvious that I’m already a VIA Rail enthusiast. On longer trips I take a lower berth, because I love the meals and the comfort of being able to sleep under a duvet while listening to the sound of the train and watching the stars. I used some of my VIA Preference frequent-traveller points so this trip was free – and with VIA Preference, free means free, not paying a hundred dollars or more worth of taxes and extra charges like on an airline frequent-traveller ticket. An etiquette nuance that some train newcomers might not pick up on right away is that when you board in Edmonton, you’re joining people who have been on the train all night, and who might still be trying to sleep. That’s why the lights are off, and even if you’re excited about the adventure, you should try to moderate your voice in the economy car, and go to the lounge car if you want to play games or talk loudly. The trip to Jasper starts in darkness if you are travelling in winter, but later in the year the whole westbound leg is in daylight. You travel through the industrial backyards of northwestern Edmonton, then through countryside, along the edge of Lake Wabamun, then stop at Edson and Hinton. Shortly after Hinton, you start getting glimpses of mountains and water. There is one short tunnel. The service manager sometimes points out features of interest. The historic train station is central to Jasper townsite. There’s a coffee shop / train giftshop in the station as well as some car rental agencies and a Greyhound bus depot, and there are taxis and shuttles to the hotels and the youth hostel. Several of the Jasper hotels offer Christmas packages. The chatty personal welcome that’s common for service-industry people in Jasper is even stronger at Christmas. I chose the Sawridge Inn last year because it sounded both appealing and affordable, and I liked it well enough to return this year. Many of the Christmastime guests are families with children, but not all of them. Activities for children included decorating gingerbread houses and hanging stockings by the hotel fireplace to be filled overnight. Jasper Park Lodge has a longer list of activities for adult guests, but it’s more expensive. 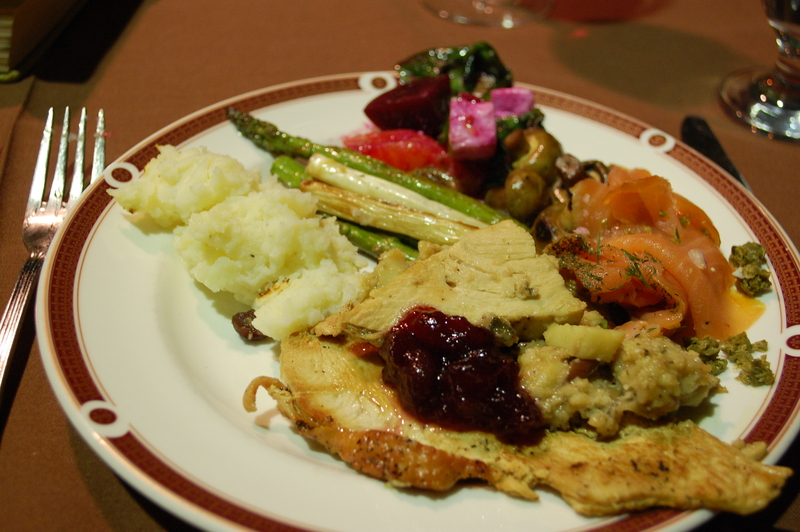 For Christmas dinner, this year’s buffet offered roast beef, stuffed pork loin, and two kinds of smoked salmon as well as turkey. The turkey was served with a good bread stuffing, together in a pan with clear “pan gravy”; there was also an opaque thickened gravy served separately. They ran out of turkey before service had ended, and substituted another meat dish. I can’t remember seeing a vegetarian entrée. My favourite of the side dishes was a “partridge in a pear tree” salad, with roasted beets, pink grapefruit, feta cheese, spinach, and a citrus vinaigrette. The wine list had many options by the glass as well as by the bottle, including more Niagara Peninsula favourites than are often seen in Alberta. My room package included a breakfast buffet as well. It wasn’t particularly exciting, but everything I tried was good. There was a problem with my dinner reservation which was not handled as professionally as I would have preferred, and I haven’t yet had a response to my email about it or my note on the customer feedback form. In all other respects the hotel service was good and the amenities were superior. The Sawridge is on the eastern edge of the townsite, a pleasant walk in last year’s mild Christmas weather. There is a free shuttle to the train station, and a ski bus also stops at the hotel. 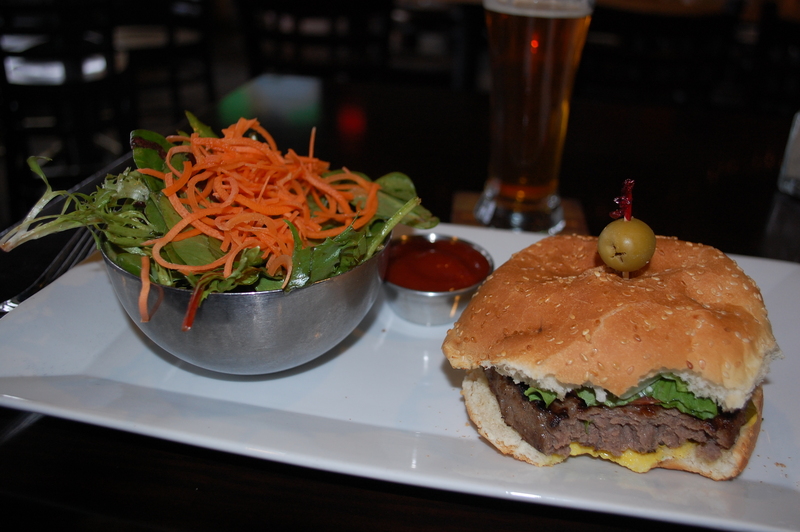 Some but not all of the Jasper restaurants and stores are open on Boxing Day. Stychen Tyme, the yarn, quilting, and needlework store, is open and worth a visit. The park visitor centre and museum are closed. 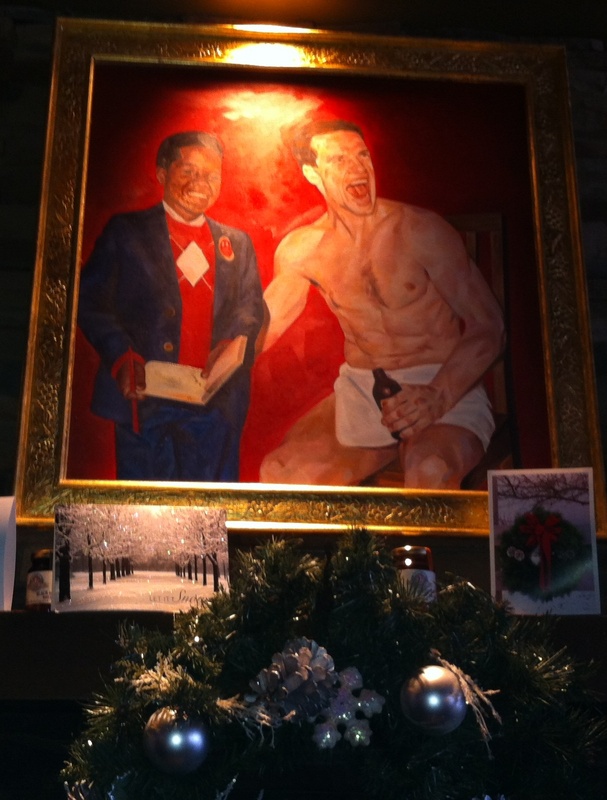 Jasper Brewing Company has an assortment of tasty in-house brews, a short menu of good food including a moist bison burger, and an oddly-disturbing painting of an encounter between the child actor Gary Coleman and the Edmonton Oiler Mark Messier. Will I go back? I like the idea of not being bound to a Christmas tradition, even one as easy as this, but I would definitely consider it, either with company or on my own. This entry was posted in Alberta, Travel and tagged christmas, jasper, jasper brewing company, sawridge inn, train, via rail on January 4, 2013 by Ephemeral Pleasures.